Previous Post Leather & Leopard/ Giveaway!! October is my favorite month too! Happy Birthday! This look is beautiful! Very glam! I love this outfit! That jacket is amazing! October is one of my favorite months too! My husband and I just celebrated our 9th Anniversary today! So Happy Birthday/Anniversary a few days early! October is my favorite month as well!! Happy early birthday and anniversary! For me, it's all about the dark and neutral colors. But now that you mention it, I do wear more sparkly clothing. Love this embellished top! Can I ask where you set your aperture? I love how your photo backgrounds are blurred, but not overly so. Loving all the glitz and glam here! The baubles and sequins make everything so fun! Love this look! Those eggplant coated denim jeans are seriously to die for. I've been looking at them forever and I think I may just get them. Ha! This outfit is so perfect! 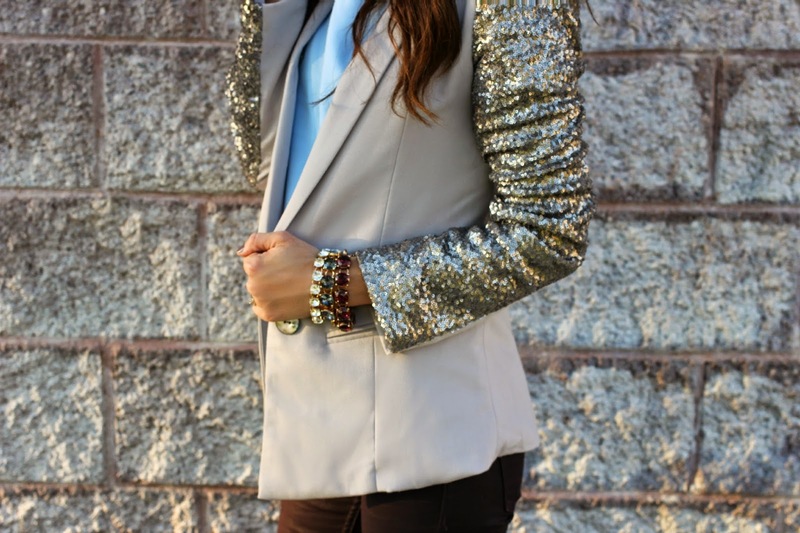 Love the blazer and the jeweled top! I love this jacket. I am obsessed with the sparkle. I need a blazer like that! I'm sure my husband wouldn't really agree on this being a 'need', but I'm still going to go with "I need this!" Love this whole look! I really need a new handbag.